Two comics from January 29, 2014. Scratch that. Aaron is sick, so here's hoping you're all #TeamAndrea since she's flying solo on the intro today. Plus your Nerd Confessions (about the books you read when you're feeling down) and Aaron's Inner Child maybe Andrea's Inner Child for a change? On The Couch: writers Chris Sims and Chad Bowers. The theme of the show this week is being alone. Sure, you can call it solitude. Sure, you can get all introspective about it. Sure, you can even claim you like it. But at the end of the day? You're alone, man. How does that really make you feel? Chad and Chris work together currently on Sub-Atomic Party Girls, published digitally by MonkeyBrain Comics, and previously on their web comic Awesome Hospital. 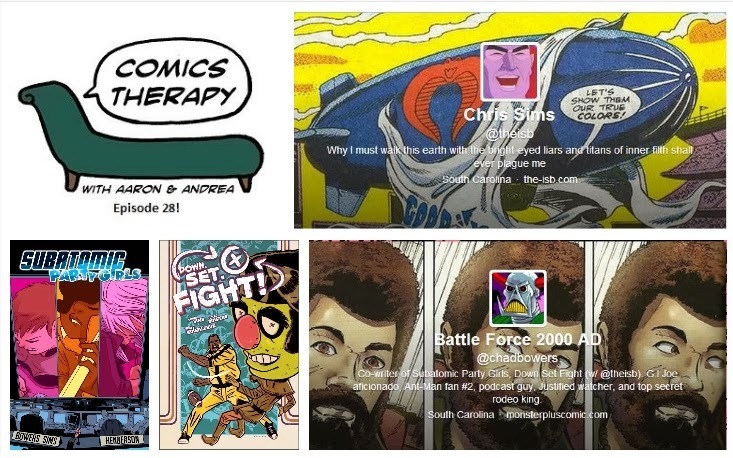 Chris also writes for Comics Alliance and is co-host of the War Rocket Ajax Podcast. Chad hosts Multiversity’s The Hour Cosmic Podcast and also writes his own web comic Monster Plus. Their new book, Down, Set, Fight, is available currently in chapters digitally on Comixology and will be out in print from Oni Press in February.